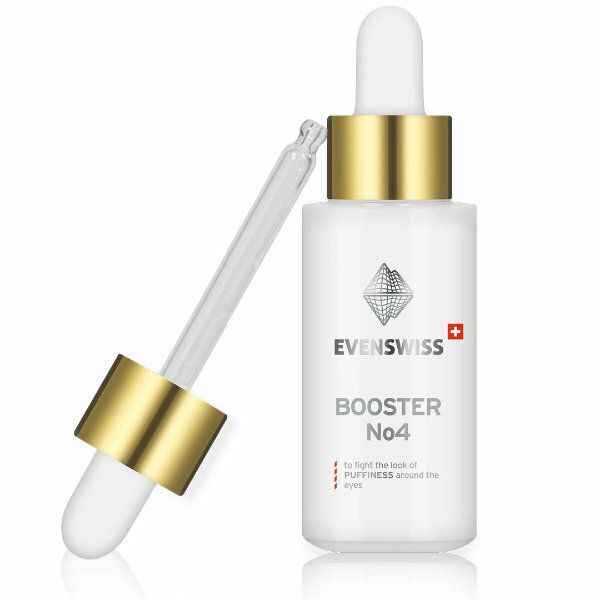 BOOSTER LINE | EVENSWISS®: a leader of signalling cosmetics. New age in anti-aging beauty care! A revolutionary Anti-Ageing Booster packed with powerful patented skin rejuvenating peptide complex – Dermatopoietin® (IL-1α). Designed for all those concerned with ageing skin. This booster will reinforce the collagen synthesis and support the skin’s natural renewal process from inside. Our Anti-wrinkle Booster is formulated for all skin types. This formula is designed to reduce the appearance of wrinkles and fine lines and rejuvenate the skin. Our Anti-dryness Booster is designed to moisturize, calm and protect especially sensitive or irritated skin. Our Anti-age spot Booster is loaded with proven brighteners like niacinamide and arbutin to effectively fade the appearance of dark spots. Our Anti-puffiness Booster is designed to calm skin hypersensitivity and reduce local skin puffiness. Our Anti-dark Circles Booster is designed to create a brighter complexion and to even out skin tone while diminishing the appearance of fine lines and wrinkles. Our Anti-loose Skin Booster is designed to increase the elasticity, resilience, firmness and density of the skin. Our Anti-dark skin Booster is designed to improve the appearance of uneven skin tone, to enhance skin clarity and luminosity. Based on a purified extract of organic mustard sprouts combined with natural capsaicin that converts fat-accumulating adipocytes into cells that actively burn fat, our Anti-cellulite Booster combats existing cellulite and prevents its formation. Based on sprouts of organic pea our Hair Volume Booster is designed to reduce hair loss by inducing dermal papilla cells to reactivate hair growth and thickening it naturally. This fast absorbing emulsion replenishes moisture and leaves your skin supple and fresh. It provides the basis for the application of specific Boosters to improve the condition of your skin according to its needs. This emulsion moisturizes skin without irritation and leaves it supple and smooth. It is used for relaxing massages in combination with Boosters to improve the condition of your skin according to its needs. This gel provides the basis for the application of the Master Booster and Booster No9 Hair Volume.